With the influence of the Internet, and social media in particular, more and more folks are getting out to explore our trails. We’re presented daily with beautiful images on Instagram and Facebook, and inspired to trail run by the numerous films that appear regularly on YouTube. But by and large there is very little information shared along with those about how we should value and look after that environment. To me, it’s vital that we all think about trail etiquette – how to respect and maintain the beautiful natural environments that we choose to run through, and how to respect our fellow trail users. It’s important to recognize that we share the trails with others. At the top of that list are the animals who call our trail running routes home – bears, deer, whatever animals they may be – and their well-being should always trump our “need” to get a trail run in. We also share trails with other humans – hikers, mountain bikers, skiers, etc. Some trails are reserved exclusively for certain users but others are multi-use trails so we should remember that no one user has priority. This might mean waiting for several minutes to pass a group of hikers until there is a suitable passing spot or stepping aside to allow a mountain biker to negotiate a technical descent. Sure, your run pace might slow a little but that’s not the point – respect between users and even better, a friendly hello and a few words in passing will go a long way to foster a friendlier environment for us all. Respecting wildlife and the fact that the trails are their home might sometimes mean forgoing a trail run altogether. Seasonal trail closures often exist because of nesting birds, to protect a sensitive plant or because a mama bear has been sighted with her cubs. Yes, it’s frustrating when you’d planned a route and can only get to that area on one weekend this year, but it is what it is. If we don’t respect the flora and fauna then we might lose some of that wildlife altogether. Trail closures are often for our own safety too. Where I live in Canada, many backcountry trails are closed in winter due to avalanche risk and yet each year runners flout those closures because they think they have the skills to negotiate the terrain. Invariably the folks we hear about are the ones who run into trouble and have to call our volunteer rescue service to come rescue them. This is simply unacceptable – sure, there are some folks who have a suitable skill set, who are physically strong and who are well equipped, but even so – it’s common courtesy to respect trail closures. There are always plenty of other trails to explore – come back to that closed route in a few months when it’s open and conditions are safer. There will always be trail users who get injured or lost and to me good trail etiquette means that you might have to end your run in order to help that person. It goes without saying that you should stop if you see a mountain biker down on the ground or a runner who has twisted their ankle. But also look out for folks poring over their phone looking for directions, or runners who look inadequately prepared for the trail they are about to tackle. No, you don’t want to force your opinions on others, but asking someone who looks a little lost if they need help or asking those runners who look ill-prepared where they are heading, can save lives. Be a friendly face on the trails and politely share your knowledge and expertise. Finally “leaving no trace” is vital but we can take that one step further still. I don’t think many of us would intentionally drop litter on a trail, but how about actually stopping to pick up any litter you see on the trail? It takes seconds and yet if we all do this, our trails will be in a better place. The same goes for staying on trails in sensitive environments – a shortcut might be tempting but could lead to ground erosion or endanger sensitive plants so we shouldn’t ruin them by deviating off into fragile environments. And to go one step further – do some volunteer trail work in your community – it takes just one day of hauling rocks and wood or shoveling dirt to appreciate that our trails take many hours of hard work to be created and maintained. 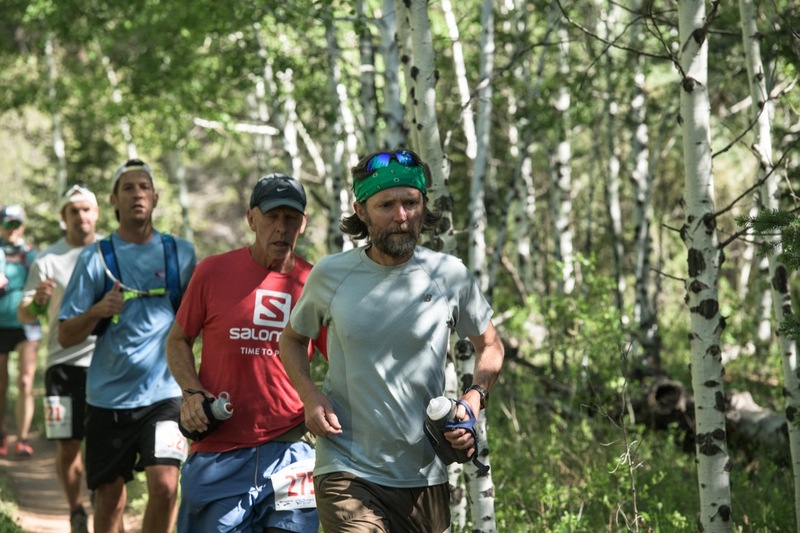 Overall, consider why you trail run and what you value about being out on the trails. By considering that question and realizing that we are all part of the trails might help guide you to do your bit to maintain the ethos, environment and atmosphere that drew you to becoming a trail runner in the first place. Great article and superb advice. Thanks for sharing! On many Forest Service and local trails, there is a signed priority for users. Horses get the ROW for obvious reasons, and the proper etiquette is to step off the trail and squat down until the group passes instead of running by close to the animals. I also take off my “sheik hat” that might blow in the breeze and disturb the horse. Second is hikers and presumably runners, and finally mountain bikes who give the ROW to all others. However, based on my experiences of running in a race on trails shared with bikers, I would give the ROW to the biker working to get up a rough steep trail when I meet them while I am running down the trail. If they have to stop to let runners by, getting the momentum to get going uphill is difficult – so let the runners and the hikers step aside and let the biker continue up hill. We obviously have no problem getting going downhill again. All of this is pretty simple, and it goes a long ways to keeping the peace among the users out there on the trails. The deeper I go into the back country, the more likely it is that I’m running into hunters and horse riders. My experience is that these are two groups who share a love for wild places.